Upgraded this summer, this techy shirt is designed for the outdoor enthusiast and built for mountain and everyday adventures. 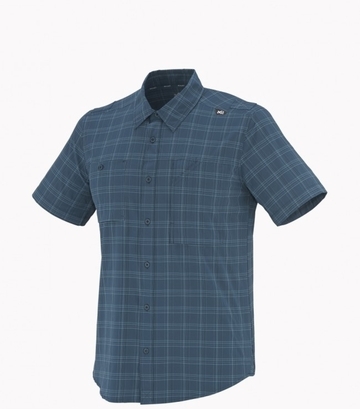 The Pokhara short sleeve shirt offers great comfort for alpine and urban activities. The Drynamic� 4 Ways Stretch light fabric is a latest- generation woven fabric and provides 4-way stretch and moisture wicking properties. It is cool, lightweight and particularly pleasant next to the skin in hot weather. Quickdry and Anti UV treatments provide additional wicking performance and UV sun rays protection. The Regular Fit� prioritizes comfort and ease of movement. Multiple chest pockets allows storage options, making the Pokhara shirt ideal to wear on hiking sessions, mountain outings, traveling and for a casual style and everyday comfort.